February 28, 2018 (Dover, DE) – On Friday, April 6, 2018 from 5:00 -7:00 p.m., the Biggs Museum will highlight its 25th Silver Anniversary Celebration by opening an exhibition on the famed American silversmith, Michael Izrael Galmer, entitled Monumental: Michael Izrael Galmer, Silversmith. Based in New York City, contemporary silversmith Michael Galmer has succeeded in becoming one of the country’s leading craftsmen, having created silverworks for Tiffany and Co., Lenox, Gorham and Kirk Stieff. With a unique casting technique, the artist has developed a wide variety of highly decorative jewelry and vessels as well as the renowned Preakness trophy. The artist is following an impulse to create much larger works for commemorative and contemporary sculptures. These works are now collected by such distinguished institutions as the Holocaust Memorial and Tolerance Museum, the Renwick Gallery, Smithsonian American Art Museum and the Cooper Hewitt, Smithsonian Design Museum. The exhibition will be open to the public from April 6 through May 20, 2018. “While Galmer is extremely well known for his commercial products of jewelry, accessories and most notably table wares – some produced for the leading American manufacturers of silver today – this exhibition honors a new and more uniquely expressive direction for the artist,” shares Biggs Museum Curator Ryan Grover. The Biggs Musuem has a nearly encyclopedic collection of silver from Delaware silversmiths currently on view within the Col. Kenneth P. and Regina I. Brown Silver Study Gallery, as well as extensive holdings of Philadelphia Colonial silver vessels. A catalog of Galmer’s works will be available for purchase during the exhibition. The exhibition will also be accompanied by a variety of programs and opportunities to meet the artist – outlined below. Born to a Jewish family in Soviet Russia, Galmer immigrated with his wife Galina to New York in 1981. He combined his background in engineering with a deep-rooted need to express himself artistically to develop a unique process of molding silver. Galmer came to prominence in American silver through a bold demonstration of his skill. He first impressed executives of Tiffany and Co. who supplied him with commissions increasing in size and importance. Galmer was also able to simultaneously seek commissions from other firms including Gorham, Kirk Stieff and Lenox. At the forefront of Galmer’s commercial production are his designs for jewelry and handbags. Of Galmer’s commercial art forms, the vases and purses are among the largest objects he has created. However, his unique casting process of silver objects lends itself remarkably well for much larger commissions. His commercial work has given the artist a tremendous following in the jewelry world, but his commissioned work gave Michael Galmer national recognition. His message has definitely resonated with collectors around the world and his work has been added to such prestigious collections the Renwick Gallery, Smithsonian American Art Museum, the Cooper Hewitt, Smithsonian Design Museum, the Evergreen Museum at Johns Hopkins University, the Newark Museum and the Holocaust Memorial and Tolerance Museum. Meet famed American silversmith, Michael Izrael Galmer and enjoy refreshments. 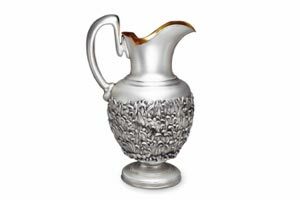 Based in New York City, contemporary silversmith Galmer has succeeded in becoming one of the country’s leading craftsmen, having designed for Tiffany and Co., Lenox, Gorham and Kirk Stieff. With a unique technique, the artist has developed a wide variety of repousse-decorated jewelry and vessels as well as the renowned Preakness trophy, commemorative silver forms and contemporary sculptures for such distinguished collections as the Jewish Museum of New York. Join renowned artist Michael Izrael Galmer for a tour of his exhibit and a discussion of his artistic philosophy and approach. Michael’s distinguished work is in the permanent collections of Cooper Hewitt, Smithsonian Design Museum, Renwick Gallery, Smithsonian American Art Museum, Evergreen Museum & Library of the Johns Hopkins University, Newark Museum and the Holocaust Memorial and Tolerance Center, New York. Attendees will hear about his unique silver making method for jewelry, vessels and sculpture and learn how he succeeded in becoming one of the country’s leading silver craftsmen with clients including Tiffany and Co., Lenox, Gorham and Kirk Stieff. Pre-registration is suggested. Free Admission on select Downtown Dover Festival Days (ie: Saturday of Dover Days, 4th of July, Comic Con). For questions, please call (302) 674-2111.